The members of genus Harpagus are relatively small raptors with rounded wings. Double-toothed Kite adult male has pale grey upperparts, including the upperwing. The tail is blackish with three greyish bars, and grey tip. On the underparts, chin and throat are white, with black central line. Breast and belly are rufous, with grey and white bars on belly. Undertail coverts are white. Undertail is barred with pale grey bars. On the underwing, coverts are white, and primary flight feathers are barred black. The head is grey to bluish-grey. Cere is greenish-yellow with black tip. It has blunt bill and double-tooth in the upper mandible, giving the bird its name. Eyes are red-orange, more or less dark. Legs and talons are yellow. Both sexes are almost similar, but female is slightly larger than male. She has browner wings and rump. 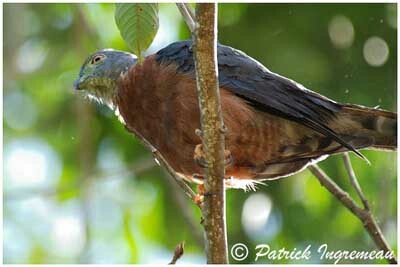 On the underparts, the breast is barred with pale grey, and belly is darker rufous. The immature has brown upperparts with whitish spots on scapulars. The underparts are buffy-white, streaked with brown. Head is deep brown. Eyes are paler, sometimes yellowish. Harpagus bidentatus fasciatus has breast and upper belly more densely barred, and underparts are usually less rufous. We can also hear various one or two syllabled calls between the mates, and high, shrill whistles “shiep” or “seeh” repeated when the birds are in the canopy. Double-toothed Kite is a vocal species, mainly during nesting period. Double-toothed Kite lives in tropical and subtropical regions such as rainforest and edges, tall second growth woodland and clearings. This species can be seen up to 1200 metres of elevation, and even up to 2100 metres, according to the range. 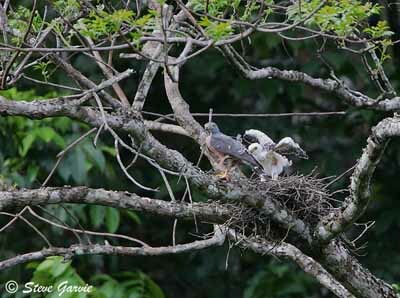 Double-toothed Kite is resident in its range from southern Mexico to South America where it occurs in the half north-eastern part of the continent, including Ecuador, Colombia, Venezuela, Suriname, the Guianas, Brazil and Bolivia. It is also present on Trinidad and Tobago. Double-toothed Kite feeds mainly on arthropods, lizards and large insects, and sometimes amphibians such as frogs. Insects are snatched from the vegetation. 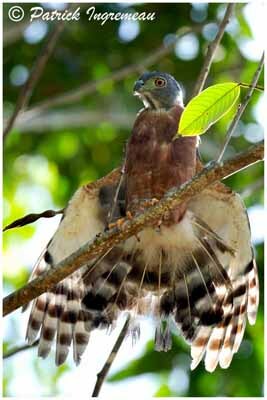 The kite sits on exposed branch and performs sallies after large flying insects. Double-toothed Kite is known for following monkeys closely. It takes the preys flushed by the primates, finding varied lizards, cicadas and other arthropods. It hunts mostly between canopy and subcanopy, following the group, often perched near the centre of the troop. The relationship between the raptor and the primates is special. There is no apparent benefit to monkeys, although the kite may protect them against attacks by larger birds of prey. Double-toothed Kite is often seen perched after a shower, with wings and tail spread, taking sun in trees. During the breeding season, Double-toothed Kite performs flight displays, similar to other Accipitridae. It performs series of stoops interspersed with brief climbs. The male also performs courtship feeding, offering a prey held in the bill to the female, while she is begging food as chick, uttering thin calls. Copulation occurs without any other pre-copulatory displays. Double-toothed Kite often soars for short periods either low or in thermals to great heights. It soars and glides with bowed wings and closed tail. But it also performs rapid flight when rising into a tall tree. But usually, its flight is similar to accipiter, with flaps and glides. The breeding season varies, according to the range, but it usually occurs between early April and early July. 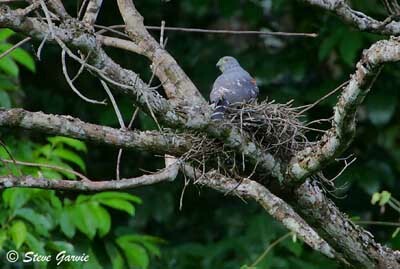 The nest is situated in a fork, high in tree. It is a shallow saucer made with twigs. Height may vary from 3 to 30 metres or more above the ground. The nest-site is usually at the edge of the forest. Female lays two eggs. Incubation lasts about 42 to 45 days. Hatching occurs during the first month of the rainy season. Chicks are covered with white down. Young leave the nest about one month after hatching. The fledgings are fed near the nest during one month or more, and then, the young disperse about 6 to 8 weeks later and probably reach their independence. The male does not brood or feed directly the chicks, but it provides the most part of the preys when female incubates and just after the hatching. Double-toothed Kite feeds mainly on large insects, cicadas and other arthropods taken from vegetation or in flight. It also consumes lizards and frogs, and small vertebrates. This raptor follows the groups of primates, taking the flushed preys. Double-toothed Kite is threatened in some areas by heavy deforestation. However, this species is relatively common in suitable habitat and it is not globally threatened at this moment.